Guys, I love sharks. My friends and family will be shocked to learn this (that’s a lie), but I can’t keep it to myself anymore. 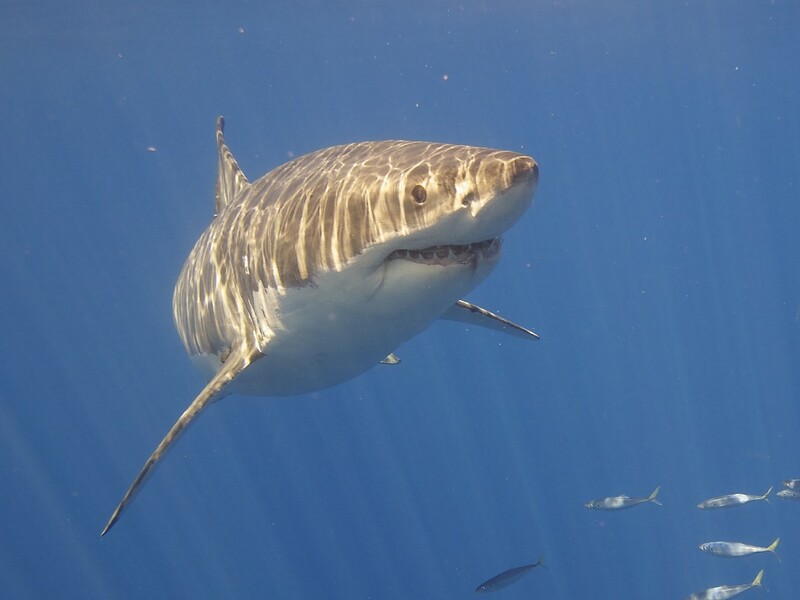 I REALLY love sharks, and particularly the Great White Shark. It has been my favourite animal since I was a kid, mainly because they had lots of teeth, but now I have educated myself (that kid had lots of books back then) and respect the fact they have never needed to evolve since the age of the dinosaurs. So when I discovered at PAX Australia that Playstation were giving hands-on demonstrations of the Playstation VR headset by simulating cage diving with a Great White, there was suddenly no purpose in my life other than experiencing it. I have wanted to cage dive with a Great White my entire life, so this was somewhat like a dream coming true. After finally getting a chance to enter the booth, the headset was put on me and the reef loaded into view. While I was standing in the cage, admiring the impressively rendered 1080p coral and the freaky ambience of the ocean, little did I know in real life I suddenly looked like a new kind of Daft Punk-esque DJ. 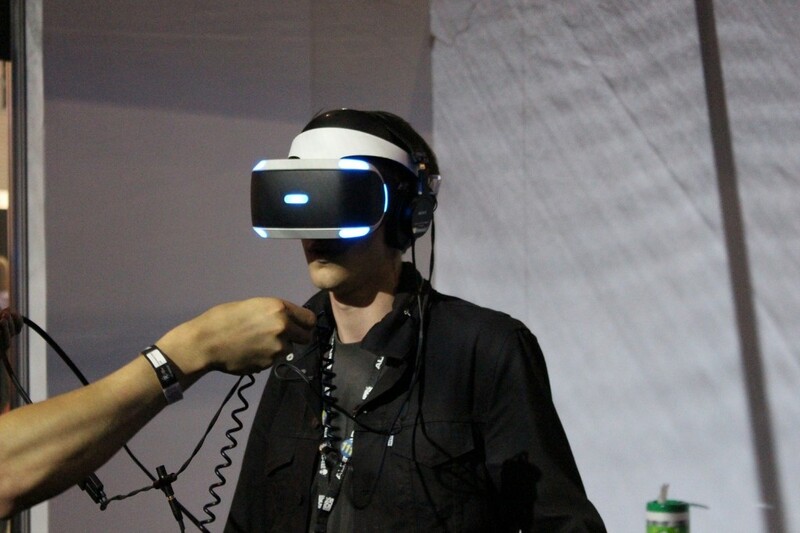 Side note: “Project Morpheus” (Playstation VR’s development title) would be an awesome DJ name. The first thing that struck me about this demo compared to the Earthlight one we played on Friday was how I could move around in the virtual environment. Thanks to the Playstation Camera tracking the lights on the headset, I was able to walk around, poke my head through the bars of the cage and really feel like I was present in the space. And the moment I looked down and saw the deep ocean below me, I very much experienced that “what is real” feeling. What began as a cool video game suddenly felt real; my eyes and ears successfully tricked my brain into believing I was in this environment. There was a sense that there were things behind me but ACTUALLY behind me, not that in-a-video-game behind me. I know that sounds really strange, but I can think of no other way to describe the sudden perspective change I felt. 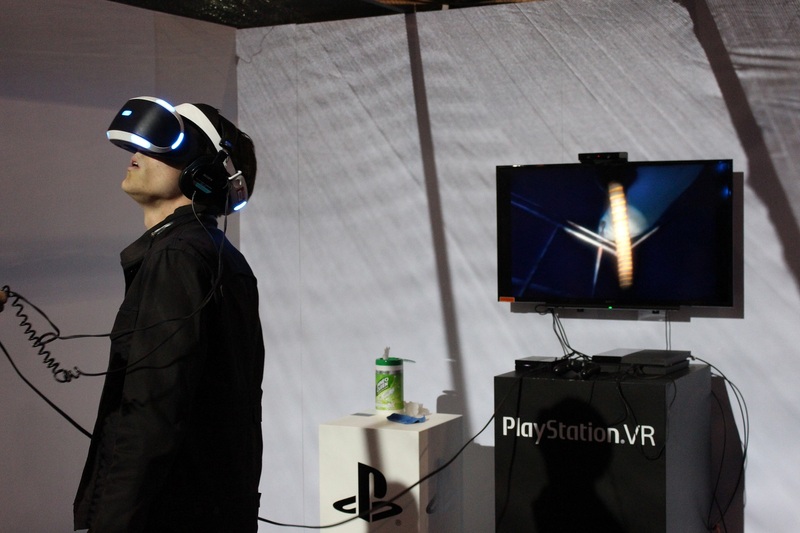 Also felt like things were up above too, and DJ Project Morpheus was clearly in awe of that. As my cage started to descend down the coral trench, the sea animals started to show up. A group of Manta Rays glided overhead, jellyfish bobbed by the cage and there was plenty of fish. As the cage went deeper and deeper, the water darkened and a headlamp activated, illuminating a nearby shipwreck. And that’s when the Great White Shark swam into view. Now, I’ve seen a lot of Great White Shark videos in my time. I have spent more late nights on YouTube watching any GoPro footage I can find of people swimming with these gorgeous animals than I care to admit, so I know what they look like and how they behave. 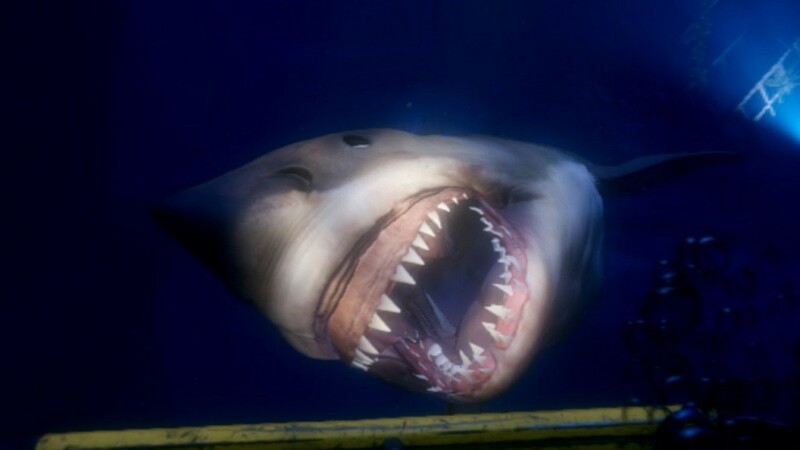 And while this virtual shark didn’t swim perfectly smoothly in an animation sense, and it ended up viciously ripping off sections of my cage (which they don’t really do, not intentionally), the way it swam into view and just cruised around was spot on and I couldn’t take my eyes off it. The strange “what is real” feeling combined with this pseudo-verisimilitude blew me away. That little kid with all his shark encyclopaedias exploded with joy. The demo also melted fellow editor Charlie’s heart. Just look at that smile! 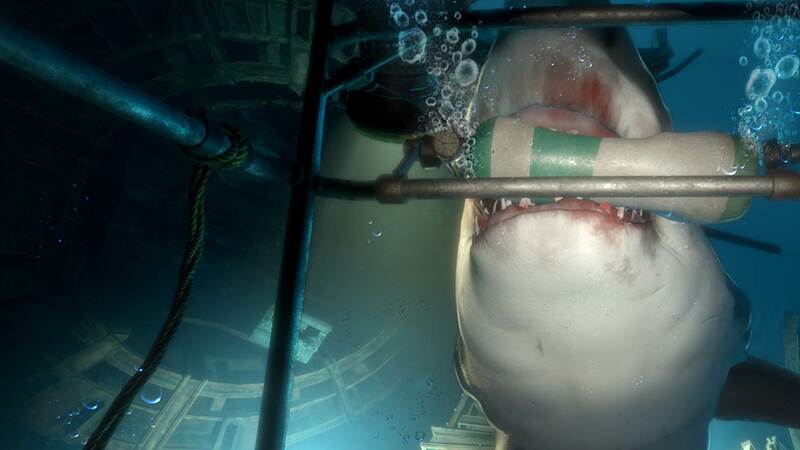 And speaking of verisimilitude and the shark ripping the cage apart: when it took that first bite and the cage rocked, for a split second I lost my balance because the visual representation tricked my brain into thinking I was moving. I knew it was coming and it still got me, knowing full well there was a crowd of people watching me through a glass wall. You nearly made me look like a fool in front of all the PAX goers shark. Not cool. 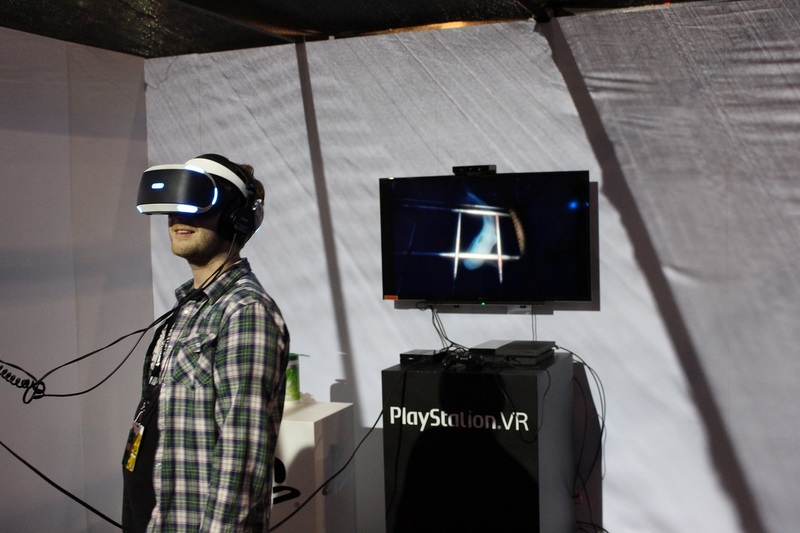 PAX Australia was my first time trying modern VR technology, so this demonstration was definitely the highlight of the event because it was the most awe inspiring for me personally. I have some concerns with using VR and it being a commercial product that I want to go into more in another post. I also want to talk about the other proper games that blew me away at PAX. But for pure “wow factor”, this demo stole the show for me. If you want to watch a video of the demo, here it is on YouTube. Obviously it’s hard to show VR in video form, but it gives you an idea of what I saw. Send your best shark stories to Tom on Twitter: @tomdheath. For more news out of PAX and everything else gaming, follow LoadScreen on Twitter, @load_screen, and like on Facebook.